Eiffel Tower will first flash into my mind once people talk about Paris; if by chance, I wish to soar over the cosy place, whiff the fresh air and surround by the romantic aura. I'm currently into the vintage style of stuffs, any accessories with antique brass will catch my gaze. 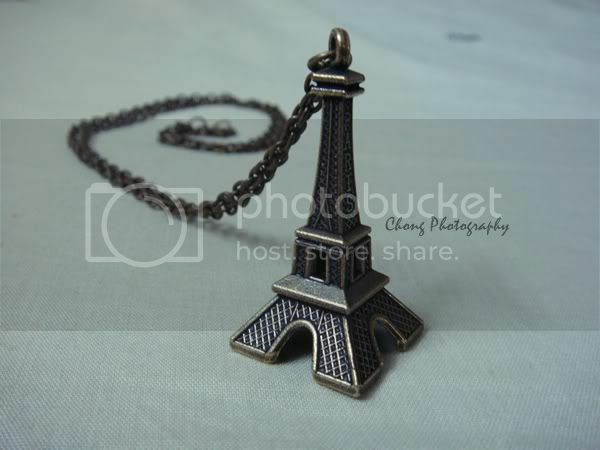 Feeling me like a collector when I look on the stuffs I own as I seldom to put them up on me, the Oh, Paris! might be the exception. Ideas and thoughts keep spinning in my little brain with exaggerated speed , they just couldn't rest their path, but I kinda like those ideas, they give me a guts to continue my dream. I want to find back the feeling that I had long lost, the passion towards stamps.